I’ve read Poornima’s blog posts for a while now – marvelling at her use of language, her ability to pick out the flavours etc in each post. I look forward to receiving them in my inbox on a weekly basis, so it was with trepidation that I agreed to write a short post on her Biryani.What could I, Dan of West Finchley, possibly comment on a home cooked, traditional Biryani? Take out the fact that I’m Jewish, we live in deep London suburbs and apart from Poornima, my experience of Indian cuisine is fairly limited. Take out the fact that my palette is accustomed to chilli. Take out the fact that Poornima is my Madhur Jafree. What you’re left with is hopefully a fairly honest, rudimentary appraisal of a Biryani. So. It was with usual honour that we attended her son’s birthday celebrations, this time in a park close to West Finchley. The sun rose to the occasion, the cider (or cidre) was present, the cricket set was well used. 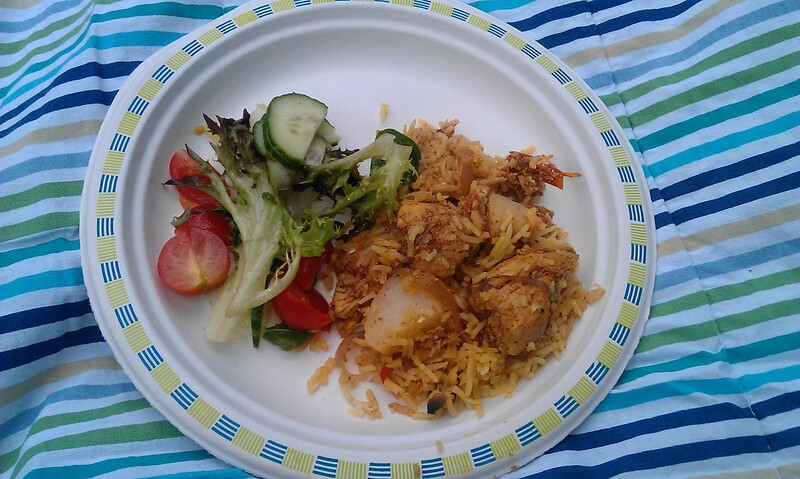 Poornima served up a fine Biryani along with salad and Dahl. I’m not here to appraise the salad (!) or the Dahl – but I don’t usually like Dahl – but this was tasty, light and provided the perfect compliment to the Biryani. So onto the Biryani. It was a combination of caramelised onions, rice, cubed potato, tender and flavoursome meat and a pure flavour overload. In each mouthful you got at least two of the flavours mentioned above, but each bite was slightly different – but equally good. The dryness/moisture ratio was exceptional and with the potato cubes, salad and Dahl, it was all bought together in a succulent dish which forced me to have four portions. So, what have I learnt today? Firstly, don’t ever agree to write blog posts whilst under the influence of Cidre. Secondly, stick to subjects I’m knowledgeable about, such as food. I enjoy eating it, so why not write about it. And I really, really enjoyed this Biriyani. This entry was posted in Biryani and tagged biryani, chicken biryani, Indian food, Indian takeaway, Indian takeway, rice by Poornima. Bookmark the permalink. I will, I will! Next week maybe.